The construction industry is known as being a sector where there is a greater possibility of having a serious accident or injury. Workers are at risk of falls from height, crushing injuries and machinery accidents. Figures recently reported from the Health and Safety Executive indicate a fall of 9 % in the rate of major injuries in the construction sector but according to top bodies at HSE, this decrease should be larger. In 2012/13 there were 1,913 major injuries compared to 2,124 in the previous year and fatal injuries also fell from 49 to 39 in the same years. 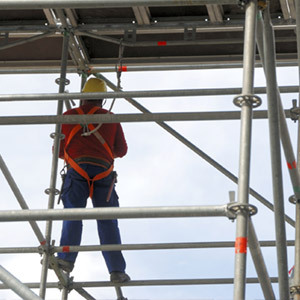 The statistics revealed that a fall from height was the main kind of construction accident that ended in a fatality with 60% of recorded fatalities attributed to it. This figure was up 3% from last year. The number of accidents in the construction was found to be disproportionate to a number of people the industry employs with the sector accounting for 5% of employees yet 27% of all fatal accidents in the workplace. She said that she had seen some ‘excellent examples of well ran construction sites where a clear focus on safety and risk management has been demonstrated’. If you have had an injury while working in construction then you may able to make a personal injury compensation claim if the accident was not your fault. Major injuries can mean you have been left with a debilitating injury, meaning you are unable to work and/or look after yourself. A compensation settlement can help remove some of the financial worries you may have following an injury. Jefferies’ no win no fee solicitors are able to help with all kinds of workplace compensation claims including construction claims. We also help with industrial disease claims like asbestos exposure and slipping and tripping in the workplace. If you would like more information and advice about making a personal injury claim then please get in touch with our friendly and helpful team on 0800 342 3206 or complete our online claim form.